This was our final day on the Diamonds of the Arctic Tour 2014. This will be the 71st blog post. We have traveled full circle above the Arctic Circle. Angelo and I had driven up Santa’s Road from Rovaniemi, and driven down the Midnight Sun Road from Olderfjord to Älvsbyn. 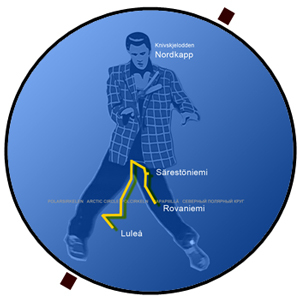 We drove on to Luleå, turned our nose north to Muonio, and were aiming for the final in Rovaniemi. On our first day in Rovaniemi we visited Korundi, a Finnish center for contemporary art. In the exhibition we opted not to look at Mr. Reidar Särestöniemi (1925 – 81) works. I was hoping that we could visit the original gallery outside Kaukonen on our tour. Now, just before re-entering Rovanimemi again, we were in Kaukonen. We had left the main road – The Northern Lights Route (E8) 100 kilometers ago. We had even left the regional road between Muonio and Rovaniemi (79). We had just driven a dirt road for 10 kilometers between Kaukonen and Särestöniemi. It is like going to the supermarket. What you need the most is stacked at the far end of the store. So you may be enticed to buy something else to and from the most important goods in the store. We had traveled half the Arctic and, finally, we were standing at the Särestöniemi-museo (Särestöniemi Museum). This is the innermost part of the supermarket. It is so reclusive that it even survived the autumn of 1944. Along the roads we have met many storytellers. The director at the museum, Ms. Anne Koskamo, had the same characteristic of the Särestöniemi family. They were storytellers. Maybe the source of these stories is the conversations in the saunas, the nature, or strong oral traditions beating one-dimensional written documentation? Anne told the story of Reidar‘s mother Alma and the picture she had on the wall of the old Norwegian Royal couple. Alma came from Vesisaari (Vadsø) in Norway. Her parents were Finnish and had moved to the Norwegian coast. She had seen the royal Norwegian family in Vadsø one time. She had a picture of them, and kept it when she married Matti. 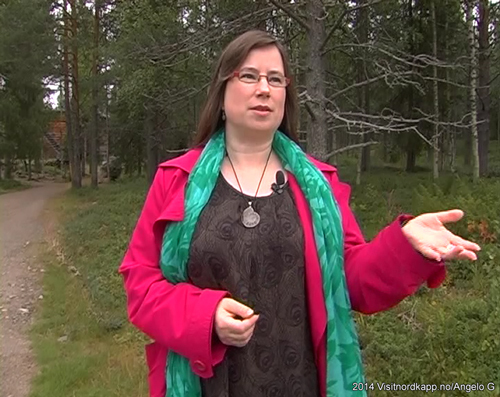 When visitors came to Särestöniemi, Alma would show people around. About the picture she would say: …and here are my grandparents from Norway. Reidar’s brother Anton lived his whole live on the Särestöniemi estate. 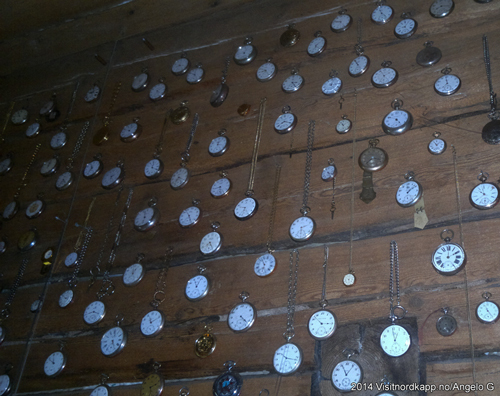 He had a large collection of pocket watches on the wall in the living room. 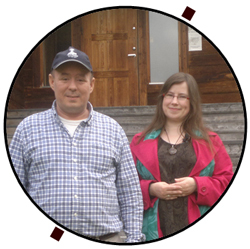 Anne said that Anton collected these watches because when people came to Lapland, there was no rush, no hurry, time did not matter. They would throw their watches, and Anton would hang time on the wall. Reidar’s grandfather Heikki Kaukonen bought the Särestö farm in late 1800s. Reidar grew up on the farm and showed early on talent for art. There are many factors contributing to his ascend in the world of art. The whole family must have supported his artistic expression. The family members would arrange their small quarters so he could paint. Throughout his life Reidar was very attached to the nature. Even after he became famous, the remote family farm remained his residence. He was attached to the river Ounas floating by. When it was dammed, the local people lost the salmon, which was a big blow to their residual income. Reidar’s art made him a wealthy man early on in his career. He could afford to build his own exotic gallery and studio at Särestöniemi. Even people without interest for art will enjoy his colorful work.